White cardboard stock Polaroid picture frame folder for #500 film. Your custom logo or message may be added to this item. Joycam Film $2.19 $1.44 $1.04 $0.96 each. When looking at your artwork, what is white is the photo frame and what is black is the stamped imprint. NO shades of grey or colours can be in your electronic artwork; your artwork must consist of white and solid black for orders under 1800 pieces. Please send your file in PC format, as a BLACK & WHITE file with NO grayscale or colour images. An electronic file which was converted to the above extensions will not be acceptable. The purpose of good artwork is to ensure that your design, when enhanced, will be clean and sharp looking; therefore, it must be that way to begin with. INVENTORY: We do not carry any inventory due to the large variety of photo frames, which we manufacture. Every order is custom produced. Send your camera-ready artwork as a black and white stat, or on a CD, to the address at the bottom of this form. No. Because a fax does not print exact straight lines, and we do not recognize it as camera-ready artwork. The faxed logo can be used as a guide only to verify the electronic artwork. What is artwork that is NOT Camera-Ready? What happens if I change the artwork after you have made the stamping die? A charge will be levied to make a new die after the initial approved die has been made. To find the earliest shipping date available for the delivery you require, please go to the Contact us link at the top right corner of this page and submit your request with the item number you are enquiring about and the delivery date you need. New Die: A new custom imprint-stamping die normally takes 5 working days to produce after you approve the final art paper proof; if a faster delivery of your die is required please add 50% to the quoted price. Note: The above shipping times are working days calculated from the day after we receive your final signed artwork and sales confirmation by fax in our office. For quantities of under 600 pieces, the imprint colour are either Gold or Silver at $0.50 for each piece and position. For quantities of 600 pieces to 1,800 pieces, other single foil colours are available at $0.60 for each piece and position. For quantities of over 1,800 pieces, a full colour process print is available on white stock. Cardboard Photo Frame each imprint cost for the same 1-colour design in the same position, using a Gold or Silver foil. Please note that we do not carry any inventory and our factory custom manufactures all orders. 10 working days after your faxed order is received for blank photo frames. 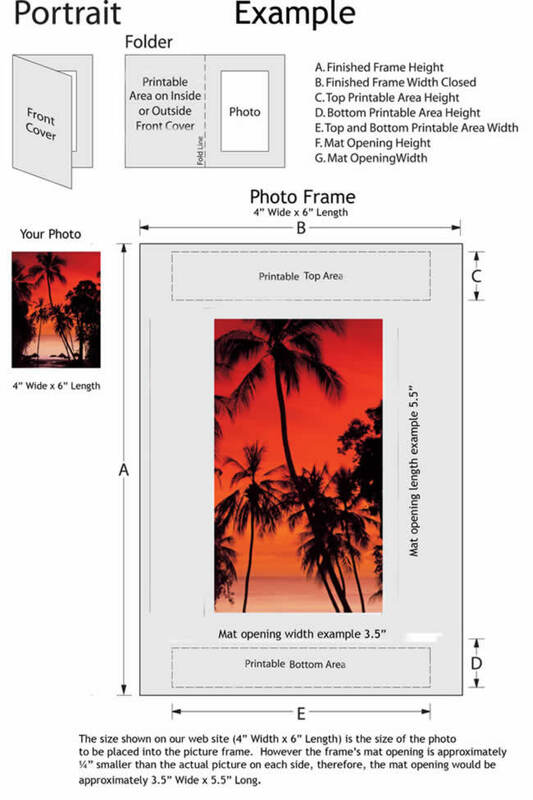 10 working days after your final artwork approval is received for printed photo frames. RUSH: If a faster delivery is required and we can accommodate your request, the cost for this service is $100.00 for blank merchandise or $250.00 for enhanced photo frames printed in one colour. NO shades of grey or colours can be used in your electronic artwork; your artwork must consist of white and solid black as the imprint will appears in one colour only. Any adjustment to your artwork will incurs a minimum charge of $50.00. If you require only text to be imprinted on your photo frames, and you cannot supply camera-ready artwork, there is an extra charge. No shades of grey or colours can be in your electronic artwork; your artwork must consist of white and solid black. Your artwork should have been created as a Adobe Photoshop.EPS (V.CS2) file or as a Adobe Illustrator.AI (V. 10) file. We are PC format compatible. If you have copied or converted another file format to the above file type required, your converted graphics will not work.